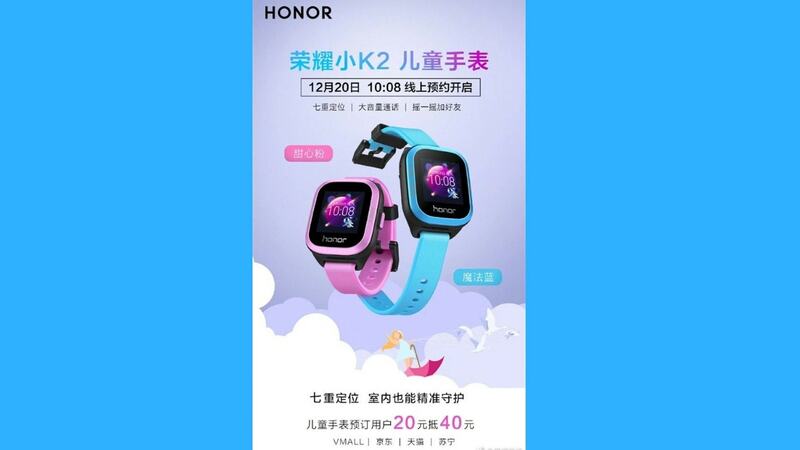 Honor K2 Kids Smartwatch packs in 4 MB RAM and 16 GB flash memory and also supports nano-SIM. Huawei launched its Honor Band 4 a few days back in India for Rs 2,599 and now the company has officially listed the Honor K2 Kids Smartwatch. The watch has gone up for pre-booking in China with a deposit that ranges from CNY 20 to CNY 40 which comes up to Rs 200 to Rs 400 approximately. According to the report in GizmoChina, the smartwatch will be unveiled on 26 December, but there is no news on the price of the watch yet. Also, the shipping is mentioned to start from 26 December. As for the specs, the smartwatch is expected to come with a 1.3-inch TFT touchscreen with 240 x 240 pixels screen resolution. Honor K2 packs in 4 MB RAM and 16 GB flash memory and also supports nano-SIM, but there might be no support for Near Field Communication (NFC). The smartwatch is said to sport a silicone strap and might be suitable for a wrist size of around 110mm to 180mm. Also, the watch can be used under light rain and while washing hands as it is IP67-certified. It supports other tools such as an address book, voice call, call record, SOS emergency call, SMS/message viewing, call notification, weather, stopwatch and alarm clock. The report further says that the kids can even add friends and start a conversation with them. The smartwatch is equipped with a security feature which helps to locate the kid's position. There is also a weird thing that is mentioned where the parents can issue rewards to their kids and the kids might be even ranked amongst their friends. The smartwatch is said to be compatible with smartphones running Android 4.4 KitKat or higher and iOS 9.0 and higher. Also, it is supposed to be powered by a 660 mAh battery pack which is said to offer seven days of standby time. The watch is expected to take two hours to get fully charged.